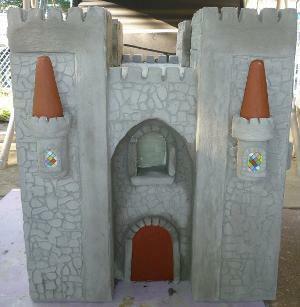 Here's a model castle constructed by one of my visitors to this website. 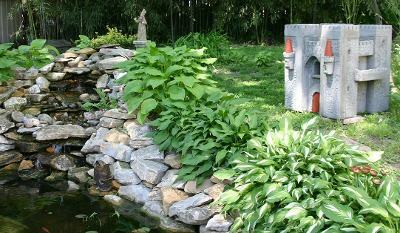 This castle was made for a garden -not for a pet lizard- so the sealent stage was slightly different. It's quite interesting to see the various projects that might be created from using the ideas on this site. 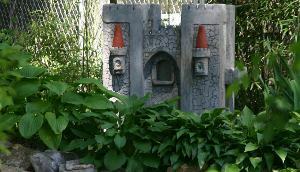 So, get creative and construct a model castle for your garden, home, school assignment or reptile cage! I just wanted to thank you for your wonderful and well done video on how to make a castle. 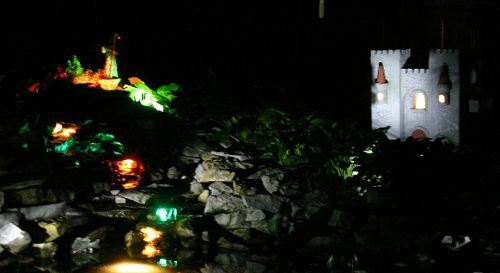 It helped me achieve what I needed for my ‘mystical/magical’ themed garden! 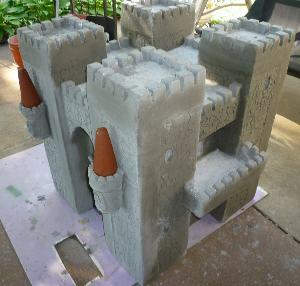 Here are several pictures of the castle that I made. 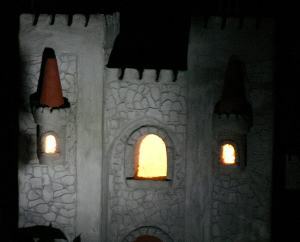 The castle’s dimensions are approximately 3’x3’x3’. I really like it and couldn’t have done it without your technique and the internet of course! I would estimate that I’ve put around 60 hours in this project…75 pounds of grout…3 sheets of Styrofoam and more tubes of liquid nail than I care to count! It has faux stained glass windows in the balconies and has christmas lights inside to light up all the windows at night! Now I guess I’ll have to wait and see how it handles being outside with various weather conditions. It is sealed and since it wasn’t for reptile use I used Behr’s sealer for concrete/masonry. For the bricks I used your technique using the Sculpey. I had 2 or 3 molds of various brick/rock patterns to alternate with -since I had such a large surface area to cover I wanted to make sure the pattern didn’t look like it repeated too often! But it worked great!